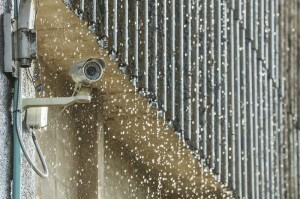 Outdoor video surveillance systems play a major role in securing large commercial and industrial facilities. Video security is especially useful in deterring theft and vandalism on commercial and industrial property, as well as giving a clear picture of who was at faults in accidents on-site. In order to keep the components of an outdoor video surveillance system functioning, consideration must be taken regarding weatherproofing of these components. Exposure to excessive heat, cold, rain, sleet or snow can damage or ruin these highly sensitive pieces of equipment, which makes weatherproofing a priority for owners of outdoor video surveillance systems. Here are some things to keep in mind when considering a weatherproofing solution for an outdoor video surveillance system. Knowing your system is the first step in taking measures to weatherproof it. You must familiarize yourself with all of the components of the system and what exposure to the elements they will face. Weatherproof enclosures “will house power sources, network PiE switches, wireless access points and anything else that may need to be installed outdoors, near the cameras while providing protection from the elements.” You must also determine the scope of the project, how much weatherproofing will be required, and an estimate of how long it will take to complete. Weatherproof enclosures have ratings that inform consumers of their ability to protect their contents. These ratings include the NEMA rating by the National Electrical Manutfacturers Association and the IP (Ingress Protection) rating. NEMA ratings range from 1-10, and most outdoor security components are sufficiently protected by anything in the 3-4 range. The IP rating consists of two numbers, the first on a scale of 0-6 and the second on a scale of 0-9, with 0 being the least amount of protection. The first number rates the enclosures protection against solids and the second against liquids. A good rating for protection of outdoor video security components is 56, which protects against solids as fine as small dust particles, and against strong jets of liquid such as driving rain, with limited ingress permitted. This entry was posted on Thursday, August 28th, 2014 at 1:52 pm. Both comments and pings are currently closed.